DGRP (Dillon Guido Recreational Product) is the manufacturer of the Rollable Easy Load Ramp for ATVs and sleds. The ramp features a winch point to alleviate the stress some riders have when it comes to riding their ATV up a ramp and into their truck. With this product, you can slowly, and safely, winch your ATV up to the top of the ramp. This means no chance of tire spin or rolling backwards. “Not all of us have the luxury of owning a trailer to tow an ATV or Snowmobile and getting your ATV or Snowmobile from one location to another can be an issue at times. 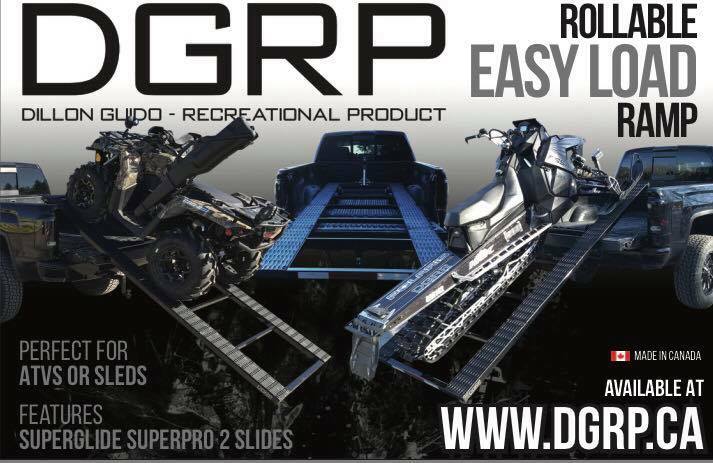 DGRP has come up with a Rollable Easy Load Ramp that you can use to place your ATV or Snowmobile into the bed of your truck. You drive your ATV or Snowmobile onto the ramp and with the ball bearing 6” CASTER wheel rollers underneath, you pick up the back and push it into the bed with a teeter-totter weight distribution towards the front of the ramp that you can easily pick up from the back. You can do this by hand for your Snowmobile or with the bolt on removable winch bracket we provide for your ATV. This is a high-grade aluminum ramp that is easy to maneuver and has super-glide super-pro2 sliders. Take your ATV or Snowmobile where ever and whenever with ease! This ramp is completely non-mountable, in and out of the box within seconds weighing in at only 70lbs and engineered and stamped off for 1000lbs! 4×10 aluminum construction that works for sleds and ATVs. DGRP is also set up with customs/shipping for customers in the USA.